EXETER, N.H. (November 12, 2015) — New Hampshire’s hospitality industry requires a lot of hot water to clean dishes, provide showers and keep swimming pools comfortable. In a state where many people spend their vacations, ReVision Energy has helped a number of local businesses maintain a financial competitive edge while curbing fossil fuel consumption. 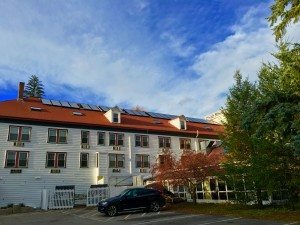 Some of ReVision’s solar hot water installations include the Woodstock Inn Station & Brewery, Inn at Sunset Hill, Purity Springs Resort, Moat Mountain Smoke House & Brewing Company, The Common Man restaurant in Concord and the Eastern Slope Inn Resort. One of the company’s larger projects is a system of 24, flat plate solar collectors and a custom-made, 700-gallon hot water tank at Eastern Slope. On a sunny day, the resort’s system can raise the temperature of 700 gallons of water from 70 degrees to 160 degrees. Gil Harris, chairman of Eastern Slope’s sustainability committee, has been named an “environmental champion”, the highest environmental designation by the state’s Sustainable Lodging & Restaurant Program. “The implementation of solar panels is reflective of the resort’s proactive commitment to incorporating best-in-practice green initiatives as they become available,” said Harris. Flat panel solar thermal collectors are over 90 percent efficient, producing substantially more heat per square foot than solar photovoltaic panels paired with an electric water heater. The collectors are an attractive solution for applications with large hot water loads, limited roof space or less-than-optimal roof orientations. Flat plate collectors work by harnessing thermal energy from the sun. When the rooftop collectors are warmer than the water storage tank, a differential temperature controller activates a pump. The pump then circulates a non-toxic antifreeze mix up to the collectors and then down to the tank through a closed-loop system, never allowing the antifreeze to come in contact with the water supply. The heated fluid is then pumped to an insulated water storage tank where it passes through a heat exchanger. The cycle continues as long as the sun shines. A backup system is integrated to provide hot water in the absence of sunshine. ReVision Energy is northern New England’s local solar professional, with more than 5,000 system installations since 2003. ReVision designs, installs and services commercial and residential systems and offers financing. The company is a certified B Corporation which meets rigorous environmental and social standards. ReVision was recently named a top ten installer by SolarReviews, a nationwide consumer rating service of solar companies. ReVision has four locations throughout New Hampshire and Maine.